Part of France's history can be reviewed at this year’s Rétromobile: a number of unusual vehicles on loan from the Palais de Compiègne will be on show, chronicling the transition from horse-drawn carriage to the car. Should Rétromobile be rebranded as a place where miracles can happen? The idea is not quite so preposterous as it may seem – just take a look at some of the masterpieces on show, particularly those in the area for vehicles on loan from the Palais de Compiègne. This French château was built by Louis XV and Louis XVI, and then restored by Napoleon and Napoleon III. Although it is often overlooked in favour of other residences, it is actually one of the three most important of France's seats of royal and imperial government, the others being Fontainebleau and Versailles. The castle's interiors are brimming with treasures – the imperial apartments themselves, as well as the Museum of the Second Empire and the National Car and Tourism Museum. The latter deserves recognition in its own right. It provides a near-unique overview of the history of locomotion – from the 18th-century until the 1920s. Our ancestors deserve thanks for having succeeded in preserving this heritage and preventing it from falling into ruin. This collection – which sheds light on how individual mobility has evolved over the years – is well worth a visit. It features hundreds of pieces, ranging from a selection of litters to the Citroën Caterpillar vehicle that was part of the 1924 Croisière Noire expedition through Africa. Visitors can also enjoy 18th-century ceremonial cars, carriages, velocipedes and the first motorcycles, as well as the first steam-powered and petrol-driven cars and the 1899 “Jamais contente” electric car. The museum retraces everything that symbolises the transition from horse-drawn transport to the car: everyone from Louis XV to Gaston Doumergue, or from Louis XVI to Louis-Napoléon Bonaparte is there. It tackles the Age of Enlightenment right up to the beginning of the Art Deco period. The National Car and Tourism Museum housed at the Palais de Compiègne represents the culmination of Georges Kellner’s ambitions – ambitions which began to take shape in 1900 at the Paris Exposition Universelle. This highly skilled car bodybuilder was behind the idea to include a retrospective of transport means at the exhibition, defending the need to keep a record of these pioneering days during which people were gradually moving away from horse-drawn stagecoaches to the first cars. Léon Auscher, another car bodybuilder and vice president of the Touring Club de France, emphasised the importance of preserving this heritage. In 1907, he gathered together a number of vehicles that were symbolic of the beginnings of the car at the Motor Shows held every 10 years. The International Exhibition of Hydropower and Tourism that was staged in Grenoble in 1925 gave a major boost to the project. This exhibition of vehicles illustrating the transition from one means of transport to another was so successful that Léon Auscher received backing from Paul Léon (director of the French Académie des Beaux-Arts) in order to found a national museum dedicated to cars. And so it was that in 1927, the Palais de Compiègne began hosting Europe's first museum of this type. It was an initiative that gave rise to a great deal of enthusiasm. With the help of numerous donations from the most varied range of sources – members of high society, automotive pioneers, manufacturers of luxury goods and prominent figures in French car bodybuilding – the museum gradually acquired a whole host of very precious pieces. A collection of vehicles used by France's Presidency and a remarkable set of pieces dating back to the 18th century from the Cluny Museum were also donated to the Palais de Compiègne. Berline de gala de la Présidence de la République, à huit ressorts et quatre lanternes. Nowadays, the collection features around a hundred horse-drawn vehicles dating back to the 18th and 19th centuries. Some of them played a part in major events in our country's history. For example, among the collections of city, gala and ceremonial cars we find the saloon car used by the Ottoman ambassador, delivered in 1856 for the christening of the Imperial Prince. 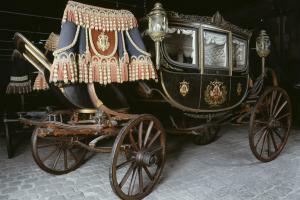 Visitors can also marvel at the saloon car that was presented to Napoleon III by Eugénie for the 1867 Universelle Exposition. When you open the door of a horse-drawn carriage, a tingle goes down your spine. The sumptuously luxurious cabs have all been magnificently preserved. Visitors can actually find themselves inside the intimate surroundings of our country's leaders. They are transported back in time more than 150 years. Our gaze alights on a luxurious car the doors of which are decorated with emblems of the French Republic. This seven-seater gala saloon car equipped with four polished copper lanterns and a decorative bronze roof rack was created by the great Parisian car bodybuilder Mühlbacher at the request of the French Republic. Reputed to have been one of the most luxurious saloons of its time, it was used to carry Tsar Nicholas II when he visited France in 1896. This saloon will be one of five masterpieces from the Palais de Compiègne on show at Rétromobile. The show will mark the first time that it leaves its home in the heart of France’s Picardy region since it first came to the museum in 1934. Contrary to what one might think, this saloon (which was harnessed to two horses) is not the oldest model being presented to the Paris general public. That title belongs to the Mancelle. 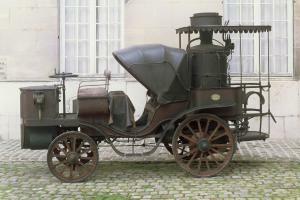 Designed by Amédée Bollée, this impressive steam-powered car was first unveiled at the 1878 Exposition Universelle at which it was awarded a silver medal. Beneath its bodywork that drew inspiration from the horse-drawn Victoria carriages, its design foreshadowed that of modern cars with its independent suspension on all four wheels, its rear-wheel drive system and its vertical two-cylinder engine at the front. It had a Field boiler located at the rear. Amédée Bollée even travelled to Vienna to present the Mancelle to Franz Joseph I of Austria. 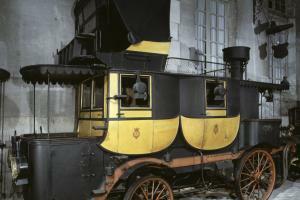 There is another Bollée vehicle on display: a steam-powered Stagecoach that was ordered by the Marquis de Broe in Mühlbacher. The car bodybuilder created a unique vehicle that could carry up to fifteen people at speeds of nearly 20 km/h. Weighing 7 tonnes, this mail coach was driven by a 50 hp engine powered by a coal fire boiler at the rear. Bollée used this stagecoach (which cost the astronomical sum of Fr.35,000) to travel from his house in France’s Sarthe département to his castle in Clefs. A pioneering period during which the first privileged few discovered the delights of motoring. Tristan Bernard, writing in the Illustration on 17 August 1894, said that "with this new mode of transport – the automobile – we can leave whenever we want. The ladies have all the time they need to make final adjustments to the veils over their hats. It really does not matter if they are a little late". Automobile à vapeur : "la Mancelle"
In addition to these three vehicles which are evidence of just how quickly individual mobility evolved at the end of the 19th century and of how creative the engineers of the era were, Compiègne has sent two velocipedes and a motorcycle to Rétromobile which symbolise the richness of its heritage. 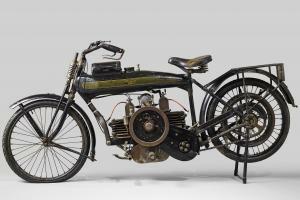 The motorcycle is a rare Terrot-Cuzeau which was built in 1916 and has been preserved in remarkable condition. It represents a major milestone in the history of the motorcycle. Henri Cuzeau was the engineer behind the flat two-cylinder two-stroke engine that was incorporated into the frame and patented. And both of the motorcycles on show demonstrate the other areas people were exploring in order to replace horse-drawn transport. 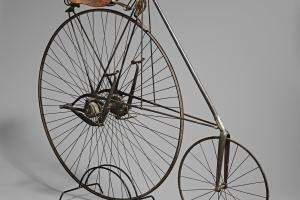 Visitors to Rétromobile can therefore admire a Grand-Bi Renard and a Star bicycle. Featuring a large wheel at the front for reaching high speeds in just one kick of the pedal, this velocipede incorporates an American-built engine which features a small wheel at the front and a large wheel at the back. One of its distinctive features is its pedal and gear mechanism which allows for three different modes: riders can pedal with a single leg when they are tired, or they can move their feet alternatively, or they can turn the pedals around completely. Once Rétromobile closes, visitors should make a trip to Compiègne so they can enjoy all the treasures of the National Car and Tourism Museum. 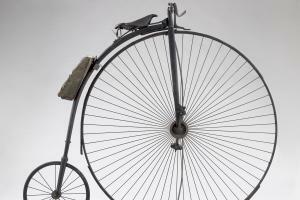 From 8 April to 4 July, it will be staging a whole exhibition retracing the development of two-wheel travel, from 1860 to 1920. Réalisée par A. Bollée, carrossée par Muhlbacker ; diligence à usage privé qui pouvait transporter 16 personnes à la vitesse de 16Km/h en palier. Elle pèse 7000Kg.